The other day I went to The Counter for my first time. They opened one up right across from E! Entertainment on Wilshire (that’s where I work), so I had to see what all the hype was about. If you are a regular on my blog, you know my favorite food is a good burger, so I was excited to see how good their burgers really are. I went with a friend from work, and we were both starving. We decided to order by phone and they said it would take 20 minutes before it’s ready. When we walked across the street, the place was packed and buzzing with people that decided to come there on their lunch break as well. We decided to eat there, and waited around 15-20 minutes for the food to come out. Meanwhile, we sat at the bar, (which is kind of cool that have a bar there), but I realized it’s not your typical fast food burger spot. It is more like a casual restaurant. 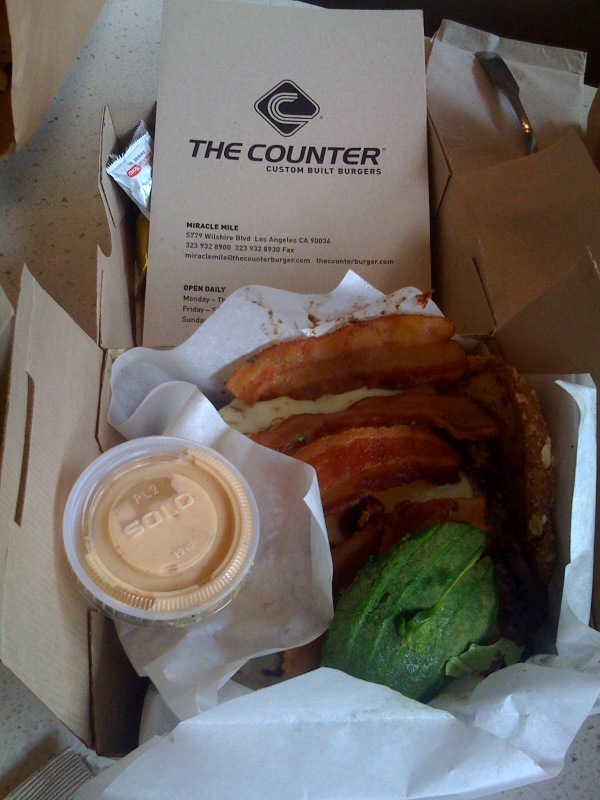 They have servers that come and take your order for the burger you want (you custom create your own), or they do have a selection of their signature burgers, sandwiches, or burger bowls to choose from, and it takes about 15-20 minutes to make. I always like creating my own because you can get exactly what you like. Some places like Father’s Office in Santa Monica and Culver City, or Umami Burger, they don’t let you subsitute anything- you have to order it exactly the way they make it. That has its positives and negatives, depending on personal preference, but sometimes you just want what you feel like. 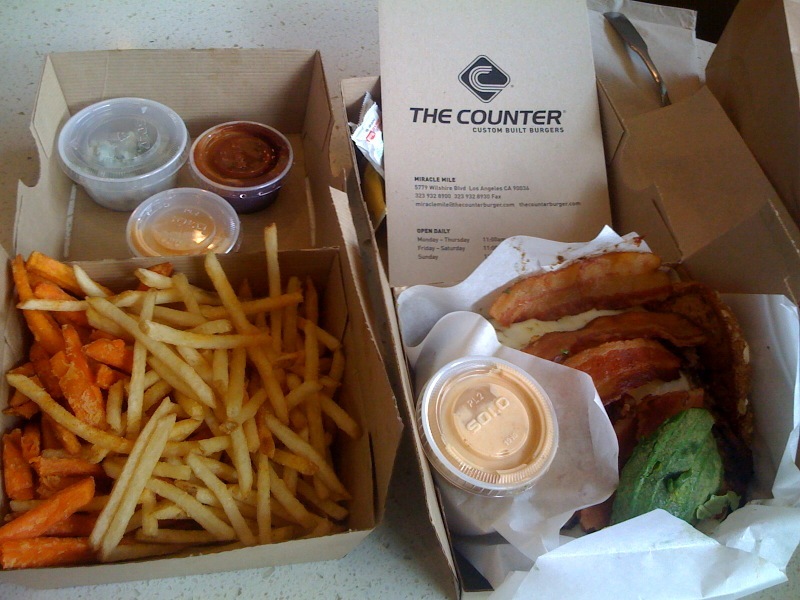 That is one good thing about The Counter. Anyway, my friend and I decided to split their 1 pound burger ( I know we’re fat lol). 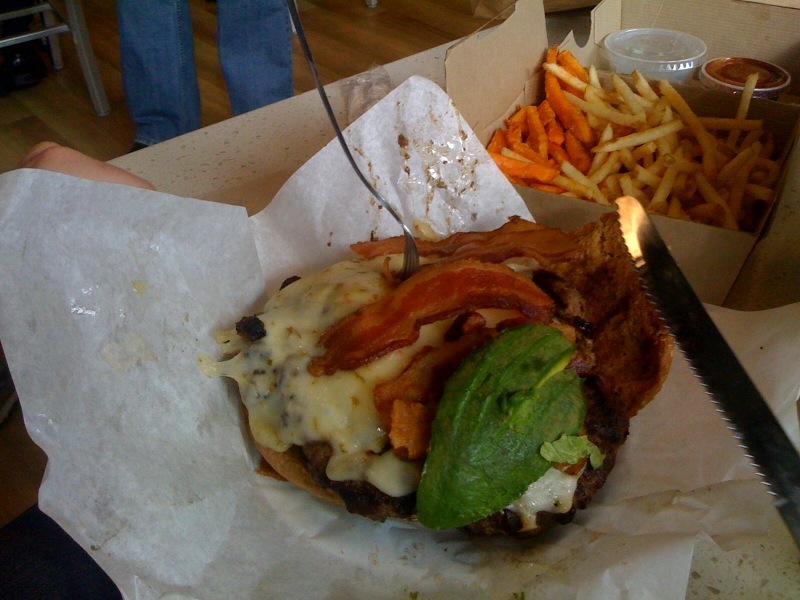 We got it cooked medium, with pepperjack cheese, bacon, chipotle mayo, lettuce, tomato, and of course avocado. We also got the “Fifty-Fifty”, a basket of two types of fries to choose from- we got sweet potato and regular fries which were both so good. 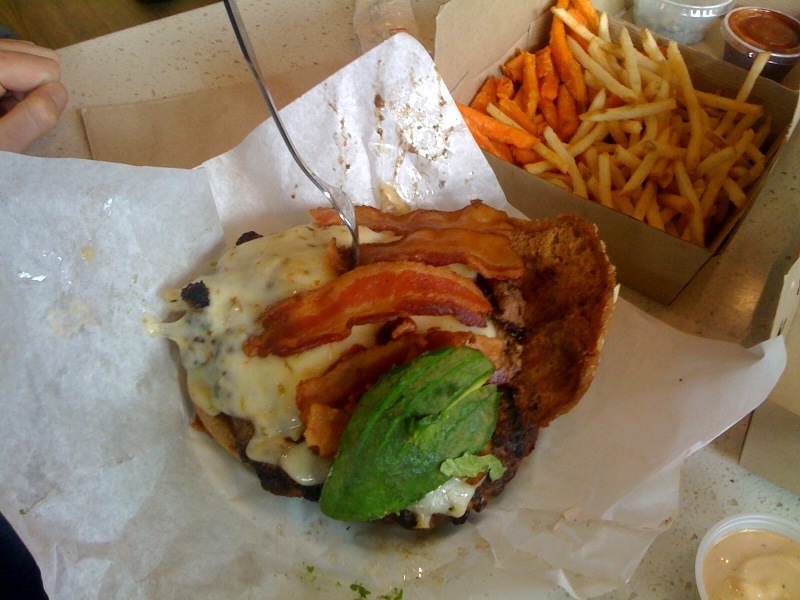 The burger was also good, messy but good. We got a lot of sauces on the side (that’s how I do), lol. BUT, it is a little pricey for my taste. Our burger and side of fries was a total of $24, and I know we got a 1 pounder, but still $24 for a burger and fries is steep in my opinion. Especially if it’s not made with steak quality meat. My heart still belongs to Flemings- their Prime burger with fries for $6 during happy hour is hard to beat, and it’s still my favorite burger I’ve had. Would I go back to The Counter? Probably. Especially because it’s across the street from my work, but I do think it’s a little over priced. I would like to go back and try something else and not get a 1 pounder lol. The place does have a good vibe and it’s a casual trendy spot.